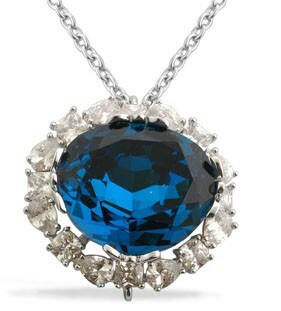 The Hope Diamond is an antique blue 45.52 carats diamond. 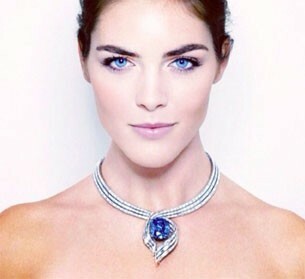 Sometimes described as the most famous diamond in the world, the Hope Diamond is believed to have originated in India. Its first known owner, a French gem merchant by the name of. Jean-Baptiste Tavernier, remarked that it came from the Kollur mine located in the Guntur district of Andhra Pradesh, during the 17th century. According to the Smithsonian Institute, the Hope Diamond is priceless because it is irreplaceable. As of 2009, it was reportedly insured for $250 million. Historical records suggest that Tavernier was not the Hope Diamond’s first owner. It is believed that he either bought or stole it from its previous owner sometime during the mid-1600s, prior to bringing it to Paris as a raw, uncut stone. Its first form was triangular, and before being cut, it was estimated at 112 to 115 carats. This impressive stone soon gained fame as the Tavernier Blue diamond. Sometime around 1669, the blue hope diamond was sold along with approximately 1,000 other diamonds to King Louis XIV of France. The entire purchase netted Tavernier 220,000 livres, which amounted to the equivalent of 147 kilograms of pure gold. Tavernier was also granted a patent of nobility as part of his payment for the astonishing blue diamond. In 1678, Louis XIV commissioned his court jeweler, Sieur Pitau, to reshape the Tavernier Blue. 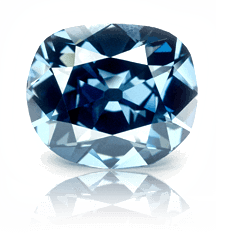 The result was a 67.125 carat stone that was then listed in the royal inventory as the Blue Diamond of the Crown of France. The king had the triangular diamond, which took two years for Sieur Pitau to perfect, set in a gold cravat pin that received additional support from a ribbon worn around the neck. In 1749, King Louis XV had the blue hope diamond reset by court jeweler Andre Jacquemin. It made its way into an elaborate jeweled pendant for the Order of the Golden Fleece. The piece included 112 yellow painted diamonds and 83 red painted diamonds meant to resemble a fire-breathing dragon. After Louis XV died, the diamond became the property of King Louis XVI, but was rarely used. In 1792, during the early stages of the French Revolution, thieves broke into the Royal Storehouse and looted most of the crown jewels. The French Blue disappeared from history, and various accounts suggest that it was disguised by being cut into two. In September of 1812, the diamond resurfaced in the United Kingdom. Various reports argue over its ownership between 1812 and 1830, saying it may have been in the possession of Caroline of Brunswick or England’s King George IV. After his death, the diamond once more disappeared, perhaps given to or stolen by his last mistress, Lady Conyngham, or perhaps liquidated to covers some of his massive personal debts. London banker, Thomas Hope, who purchased it for a seemingly paltry sum between $65,000 and $90,000, later acquired the stone. The Hope Diamond appeared in a published catalogue of the gem collection of Henry Philip Hope in 1839. It was set in a medallion, surrounded by smaller white diamonds, and was often worn by Louisa de la Poer Beresford, Thomas Hope’s widow, for society balls. It was during this period that the stone became officially known as the blue Hope Diamond. Henry Philip Hope died in 1839, after which his gem collection was split up. His oldest nephew, Henry Thomas Hope, acquired eight of his most valuable gems, including the Hope Diamond. It was usually kept in a bank vault, but was occasionally put on display. It made its way to the Great Exhibition of London in 1851 and the Paris Exposition Universelle in 1855. The diamond stayed in the Hope family until 1902, when it was sold to a London jewel merchant for £29,000, which translates to approximately £2,642,000 in today’s currency – again, a very small sum for such a spectacular stone. The beautiful blue Hope Diamond made its way to New York, and between 1902 and 1907, it was owned by Simon Frankel and kept in the William & Theodore safe. Frankel sold it to a Turkish diamond collector in 1908 but the next year, it was sold at auction in Paris. It was resold to Pierre Cartier in 1910. He reset the diamond and sold it to Washington Post scion Edward Beale McLeane and his wife, mining heiress and socialite Evalyn Walsh McLean in 1911. At the time, the Hope Diamond fetched just $300,000 USD. 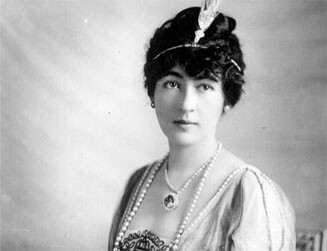 Evalyn died in 1947, and in 1949, the Hope Diamond was sold to New York diamond merchant Harry Winston in order to settle her debts. The diamond was exhibited in his famous “Court of Jewels” tour. In 1958, Harry Winston donated the Hope Diamond to the Smithsonian Institute’s National Museum of Natural History, where it has remained ever since. Its display and setting have changed a few times over the years, but it is still the museum’s most popular piece. You might have heard that the Hope Diamond is cursed, but experts say that this is nothing but superstition. The stories surrounding it are interesting, and it is true that some of its wearers have died tragically, but the “legend” that it was stolen from a cursed statue was fabricated sometime during the Victorian era, probably as a marketing scheme.